Have you just been blindsided by an unexpected financial emergency and don’t know what to do? Whether it’s a job loss, medical expenses, or an emergency home repair, an unexpected change in your financial situation can be incredibly stressful. The bills still need to be paid, the utilities need to stay on, and you need to put food on the table, so how should you cope with a financial crisis? Take a moment to sit down and carefully evaluate your situation. Running around in a panic won’t solve anything and only lead to additional stress. Understandably, you probably have a million things running through your head and being cool and collected is the last thing on your mind, but the ability to carefully evaluate your situation will ensure you make the right choices. First, determine what caused this financial emergency. Before you can look at ways to resolve the situation, you need to understand the cause. Is it a sudden loss of income? Mounting expenses that you can’t keep up with? A natural disaster? While each situation can lead to similar burdens, your plan of attack will likely need to address the root of the problem to be effective in the long run. Not all expenses are created equal. There are certain bills that need to be paid before others. Some of the most important items to put at the top of your list should be food and shelter. Is it worth risking foreclosure to keep your cable bill current? Obviously not, so carefully examine all of your expenses and determine which are the most important. It isn’t worth paying something that will put you in jeopardy of being unable to pay for a necessity. Once you’ve established which bills are the most important, you can begin looking for expenses to cut out of your budget. While it might not be much fun to cut out some of the things you’re used to, it might be what’s necessary to keep you from slipping into an even deeper financial hole. Look for ways to cut back or eliminate things completely. Think about those premium movie channels or satellite package. Maybe you can get by without an expensive cell phone plan, or maybe you eliminate your landline telephone completely. If you regularly go out to eat, consider cutting back or eating at home entirely. It doesn’t take much. If you were to only find five different ways to save $20 each month, you’ve instantly freed up $100 that can go towards your important and necessary expenses. If you’re having trouble with credit cards, medical bills, or even your mortgage, the first thing you should do is call your lender. Believe it or not, it’s in their best interest to help you make your payments, even if it means a lower interest rate or extending the terms. People so often wait until they already get severely delinquent before contacting their lenders, and by then they aren’t as willing to work with you. If you know that money is getting tight and you might need help, call them before you get behind. Calling your credit card company can result in a lower interest rate, and in some cases may even lead to a temporary delay in making payments. Reaching out to your mortgage company can lead to a restructuring of your loan. And even when it comes to your utilities like electricity and gas, they usually offer programs to help keep the lights on and make payments affordable if you’re experiencing a hardship. Don’t wait for the threatening letters to start coming in the mail before taking action. Ideally, you want to have some money set aside in an emergency fund to help pay for any unexpected expenses, but this isn’t always possible. Where do you turn when you’ve exhausted your savings account? You can always try to get a loan or use credit cards, but these may only make the problem worse. While borrowing money can provide quick access to cash, it can also come with high interest rates and a new monthly payment. 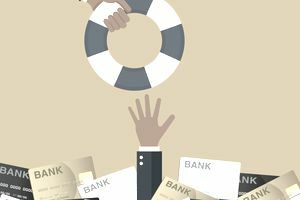 If you’re experiencing a financial hardship for an extended period of time, you may find yourself in a downward spiral that is nearly impossible to recover from. Another option could be to check with friends and family. Nobody likes to ask for money, but a little bit of help from a loved one might be all that you need to get through the rough patch. Of course, this can also put a strain on some relationships, so proceed with caution. And finally, you may have some money available via investments or in retirement accounts. Generally speaking, withdrawing money from your retirement accounts is a bad idea as it can put your retirement security in jeopardy, but it could also be enough to keep you from going into even further financial trouble. If you currently have a 401(k) or 403(b) where you work, check to see if they have a loan provision. If you take a loan from your account, you may be able to borrow funds without paying taxes and avoiding any penalties as long as you repay the loan over time. If a loan isn’t an option, you may also qualify for a hardship withdrawal or even a regular premature distribution. These are clearly the last resort, as anything you withdraw will be taxed, and if you’re younger than age 59 ½, you may also face an additional 10% penalty. When it comes to a financial hardship, there may be assistance out there for you. In the event of a job loss, you may be entitled to unemployment benefits. If your job also provided your only source of health insurance, make sure you look into COBRA to see if you can maintain affordable health insurance. If you were injured at work, ask about workers’ compensation. In some situations, you may even qualify for state or federal benefits such as Medicaid, Social Security Disability, and more. You help fund many of these programs both directly and indirectly, so make sure you’re taking advantage if you’re entitled to receive them. In addition, when it comes to a job loss, make sure you check in your local community for resources to help you get back to work. You may be able to find workshops or classes that can assist in putting your resume together, polishing your interview skills, and even do some networking to possibly find work. If you’ve made it through difficult times in the past and want to minimize the impact in the future, there are a few things you can do to prepare. Start with an emergency fund. This is exactly why they are called emergency funds. A good rule of thumb is to have a few months worth of expenses set aside in the bank to help pay for unexpected expenses or pay the bills if you lose your job. Obviously, the more you have saved, the better off you’ll be. But even a month or two worth of expenses saved up can buy you some time while you get things back on track. You also want to consider insurance. Most forms of insurance are a safety net to cover expenses. If you’re in an accident with your car, you’d want to have auto insurance. When you get sick or injured, you want to have health insurance. And when there’s a fire in your home, hopefully, you have homeowners insurance. But there are even more ways you can protect yourself financially. Disability insurance can help if you become disabled and unable to work. And life insurance can provide for your spouse or children in the event of your untimely death. Having a plan in place before a financial crisis strikes will take a lot of weight off of your shoulders. Knowing what expenses you have and how you’ll pay for them will make a stressful situation that much easier to cope with.